I want to start by saying that I love Pride and Prejudice and Jane Austen! P&P was my introduction to classics and it’s still one of my absolute favorites. Actually, I watched the 2005 movie adaptation first and after that I read the book and fell in love with it. Recently, I watched the web series Lizzie Bennet Diaries and thanks to that I decided to read the companion book The Secret Diary of Lizzie Bennet. After finishing that book, I was thinking about posting a review for it and an idea occurred to me. I’m gonna start the Pride and Prejudice Project. Yay! You may be wondering, what does that mean? . Well, it means once a month I’m gonna be posting a review of a book that is based on or is a sort retelling of Pride and Prejudice or maybe a review for a movie adaptation or a TV show or a web series based on Pride and prejudice. I will review one of those things every month or post some sort of bookish list related to Pride and Prejudice. I think it’s gonna be a lot of fun! The first post will be up next month and it’s gonna be the review of The Secret Diary of Lizzie Bennet. So if you are interesting in knowing my thoughts, come back. If anyone wants to join, I would love to do this with someone else. 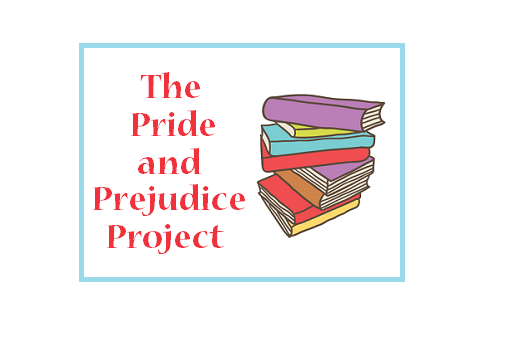 If you want to join, the idea is you post one review or bookish list every month about something related to Pride and Prejudice, there’s not gonna be a specific date. If there’s more that one person interested, I can put one those linky boxes so you can put your links. Let me know in the comments if you are interested ! UPDATE: If you are participating, you can leave your link in the comments on the lastest PPP posts on my blog, that way we can all check each other posts. Also, it’s not necessary to participate every month. Whenever you post a review or any post related to Pride and Prejudice, you can link it in one of my post . You just have to say somewhere in your post that it’s apart of the Pride and Prejudice Project and that’s it. Great idea! That sounds like fun. Of course, I will recommend the obvious: Pride & Prejudice and Zombies. I actually quite liked it. (haven't seen the movie yet). I also recently read a book in the Jane Austen Mysteries – it's a huge series of them: https://www.goodreads.com/series/40959-jane-austen-mysteries So, not to do with PP directly, but the author. Good luck! Can't wait to check in on your progress. This project is literally….it's just…. It has my name ALL OVER IT, okay?! I'm so going to join in with you on this, if that's okay? Because I looooove P&P and P&P retellings are my life and I just… Yes. So much yes to this epic fun! Oh, also– I'm Beth, from Betwixt the Pages — Nice to meet you! Hi Beth! I would love it if you join me, doing this with someone else sounds like so much fun! Sounds like fun! I'm going to add this to my list of bookish 2017 challenges that I've compiled!! Thank you, Nicole! That would be amazing, I think it will be a really fun challenge for 2017. I read two books based on Pride and Prejudice, but I gave them away. One I liked and one I didn't. I'd love to read more of them if anyone can recommend ones.